The Scottish Premier League will not say whether Celtic's Artur Boruc is mentioned in the match delegates report into Sunday's Old Firm derby. Goalkeeper Boruc wore a "God bless The Pope" t-shirt on the pitch after Celtic's 3-2 victory over Rangers. The SPL must decide whether the action could have had repercussions for behaviour among supporters. But it stressed that any discussions would be conducted in private, although the outcome might be made public. The report from Willie McDougall, a former police chief superintendent and Scottish FA security officer, was handed to the SPL on Wednesday. And an SPL spokesman said: "I can confirm we have received the report and we will be studying it. "We will not be discussing anything further about what is contained in the match report or how the process is moved forward. "Generally speaking, if there is anything contained in the match delegate's report it is usually taken forward to the club in private. "If there is any outcome at the end of the process, that may be made public." Player discipline and conduct is a matter for the SFA, but BBC Sport has learned that it is unlikely to take any action against Boruc. But, under Fifa rules, players must not reveal undershirts that contain slogans or advertising. And the SPL, while it can take no action against the player himself, could censure Celtic if it was deemed to have caused fan problems. 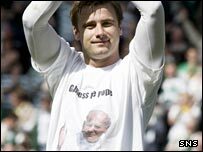 Boruc revealed the shirt reading "God bless the Pope" with an image of the late Pope John-Paul II following a vital victory for his side. Not one of my Rangers mates are offended, why should they be? Celtic manager Gordon Strachan made light of the antics of the player the club's fans call the Holy Goalie. "If it was 'God bless Myra Hindley', I might have a problem," said Strachan. The Celtic goalkeeper has found himself at the centre of controversy before during his time in Scotland. In August 2006, he received a procurator fiscal's caution for breach of the peace as an alternative to prosecution after making gestures at Rangers fans at Ibrox in February that year. However, police underlined that the caution issued to Boruc on that occasion was not for blessing himself, as some had claimed. In March this year, the Poland number one was shown a yellow card for making a gesture towards Hibernian fans after Celtic's 2-0 victory at Easter Road.